Emcee/Talker: Ukulele Loki began speaking at an early age and never stopped. 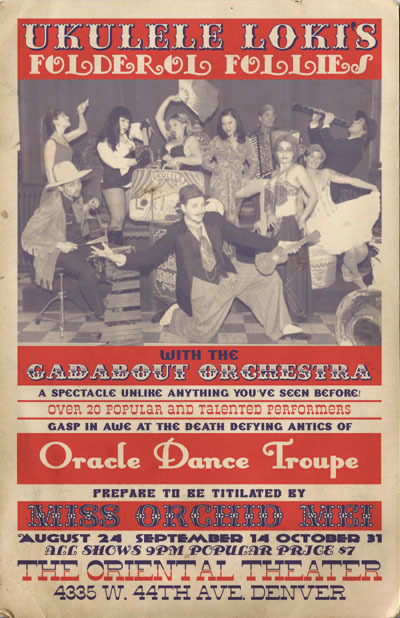 He uses his impressive skills as a verbal acrobat and raconteur to act as impresario and host a variety of radio programs as well as his own touring vaudeville show: The Folderol Follies. 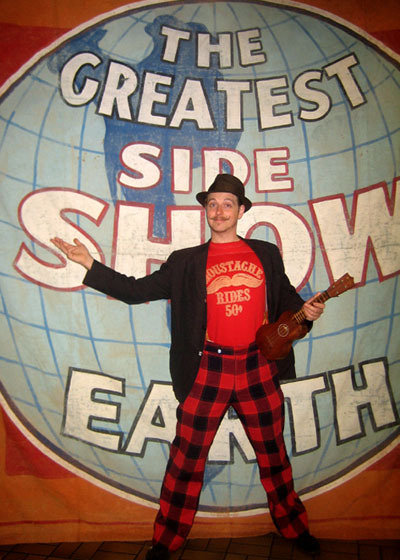 Until their break up in February of 2006, he was also the writer, director, and Talented Talker ("Barker" is a vulgar term) for an honest to gawd award winning circus sideshow: The Crispy Family Carnival. His work won his group The Circus Historic Society's Candlelight Award. He is gracious, witty, outgoing, charming, and fun. What's more, he's availalble for ALL manner of events. 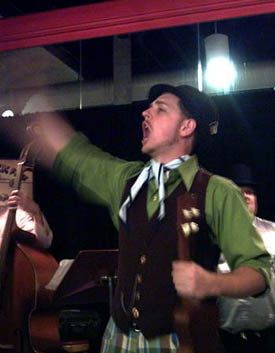 He is the the leader of "The Gadabout Orchestra," featuring tuba, ukulele, clarinet, cello, marimba, drums, and more). • Host, The Boulder Outdoor Cinema: "The Muppet Movie"
• Host, Western Wednesdays (Loki's former western music and movie event at the West End Tavern): featuring classics from The Lone Ranger, Roy Rodgers, plus The Good the Bad and the Ugly, A Fistful of dollars, and more. • Loki is featured in the film: "Showman: The Life and Times of Ward Hall" Flood City Productions, NJ. Photo (L to R): Firefly "The Midget of Mischief"; Ward Hall; and Loki. 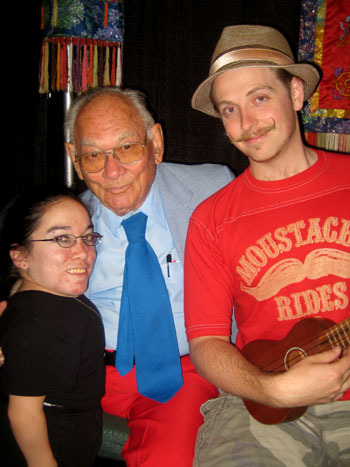 Ward Hall is not just a sideshow legend and the best talker in the business, he's a gentleman and a dear heart. Loki would like to say thank you Ward for all the help and encouragement during the past 4 years.